As you’ve probably heard, earlier this week Google held a major event to launch the Chrome Web Store and Chrome OS, its new operating system that revolves almost entirely around web apps and browser extensions. There aren’t currently any consumer laptops that support Chrome OS — and there won’t be until the middle of next year — but Google is running a test program by distributing some unknown quantity of unbranded ‘test hardware’ codenamed Cr-48 to press and select early adopters across the US. We got our hands on one of these devices earlier today, and I’ve been using it as my primary computer since then. Here are my initial thoughts. Doing a thorough critique of the hardware at this point doesn’t really make sense, given that OEMs like Asus will be announcing their own products over the coming months and you can’t actually buy the Cr-48. But here are the basics: the computer is small but isn’t nearly as light as ultra-portables like the MacBook Air (I find it to be more comparable to the 12 Inch PowerBook G4, circa 2005). There’s a USB port that currently has limited driver support, an SD card slot, and a VGA port. The keyboard is full-sized and feels a lot like the ones found on modern Apple computers. The mouse trackpad — or at least, the software running the trackpad — is a complete turd. It works well enough for basic pointing and clicking, but anything beyond that has issues. The ‘right click’ feature, which involves tapping two fingers on the trackpad, only seems to register around ⅔ of the time. Trying to select text or drag anything anywhere is an exercise in frustration. Is it fast? Sort of, but it’s not universally snappy. Click on a tab and you’ll notice a slight lag before the content is displayed — it’s not that noticeable, but it’s the sort of thing that keeps the experience from feeling fluid. Likewise, scrolling around content-rich web pages sometimes leads to a few jitters, and occasionally things slow down for a few moments for no apparent reason. But all of these things — from hardware to software issues — are sure to improve in the five or six months before we start seeing consumers get their hands on the first production Chrome OS notebooks. The fact that Flash is painfully slow doesn’t really matter, because ninety-something percent of the people reading about those problems will never even have the opportunity to use the Cr-48. By the times these things hit store shelves, all of these issues will be fixed. But the big question remains: what about actually living in the cloud – are people going to be able to forsake their traditional computers in favor of a lightweight Chrome OS machine? The answer is “probably”, but, as I’ll get to later, it will be partially out of Google’s hands. Navigating around an OS that is essentially a browser feels a little weird at first. Your music application is a browser tab. Your email is a browser tab. Your documents are browser tabs. Sure, you’ve probably used some or maybe even all of these in web-based apps before now, but it’s hard to kick the feeling that the application you’re looking for is behind your browser, or minimized in a taskbar, or… something. I know it doesn’t sound rational, but after a decade (or two) of using operating systems with layered windows, this system will take a bit of getting used to. You know that feeling when you start driving a car you’ve never driven before, and everything feels a little out of place? It’s sort of like that. Fortunately the learning curve doesn’t seem very steep. The key, for me at least, is the ‘Pinned Tab’ feature. 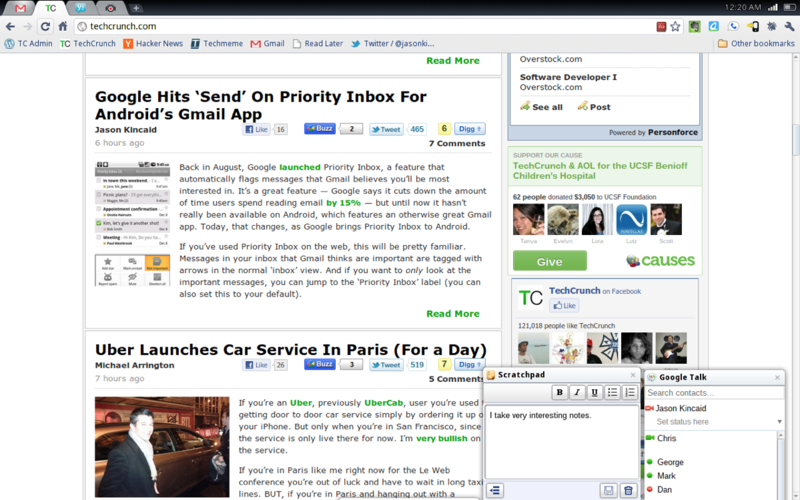 This has always been nice on the ‘normal’ version of Chrome, but I’ve found it indispensible in Chrome OS. If you fail to organize your apps you’ll find yourselves sifting through a dozen tabs every few minutes, which is very frustrating. But if you keep the apps and web sites you use most open as pinned tabs — I’ve got Gmail, MOG, Twitter, and TechCrunch for now — suddenly things make a lot more sense. Panels in Chromium OS are used as containers that allow a user to multitask without leaving the view of their current application. For example, with a music player and chat in panels, a user can control the playback of their music and chat with a friend while watching a video or reading a long document in their main view. In practice these are small widgets that rest toward the bottom of the screen, peeking up just enough that you can point your mouse at them, but taking up very little real estate when you aren’t actually using them. Move your mouse down toward these panels, and they’ll slide up a bit further to reveal their titles; click one and it will slide all the way to reveal your IM conversation, notepad, or whatever you’ve got open. You can adjust both the height and width of these panels, and they’re quite handy for anything that you need quick, frequent access to. My only problem with these so far: for the life of me I can’t find a section for apps on the Chrome Web Store that support panels; apparently you’ve got to find them yourself for now. My current suite of Chrome extensions also helps make me feel at home (I used the sync feature to port over my desktop’s current setup automatically). My Google Voice notifier, Chrome-to-Phone, and Dictionary extensions all work like a charm. I’ll have more to write in a few days once I’ve gotten a chance to weed through the array of web apps I’ve installed. So far though, I’ve got a few early favorites. 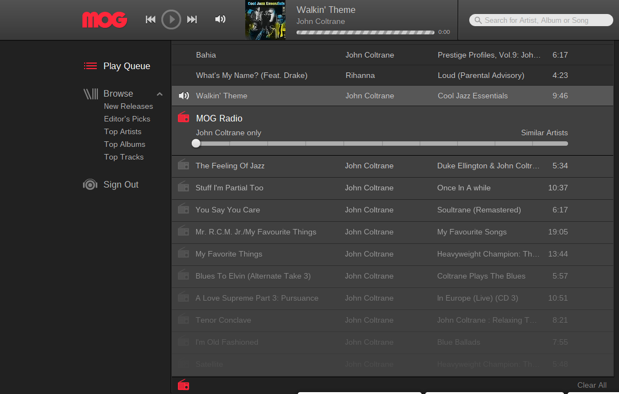 MOG’s music application (which requires a subscription after a trial period) serves as good iTunes replacement. MOG actually redid its UI for this web app to make it look more like the full-screen music browsers you’re used to, and it’s working well for me so far. I’m also pretty sure — though I’m hedging a bit — that I can rely on Aviary’s image editors as a suitable replacement for Skitch and (in some cases) Photoshop. Image editing in general feels weird on Chrome OS because I’m so used to tossing around these files locally. And Aviary’s apps can be a little disorienting because you’re thrown into another window, then have to deal with various sharing options to actually get the image you just edited. I believe you can save content to the computer’s disk, but the file manager doesn’t seem done yet. Once today I came across Chrome OS’s file browser. If you’ve never done a deep dive into your OS’s file system, this will probably scare you. 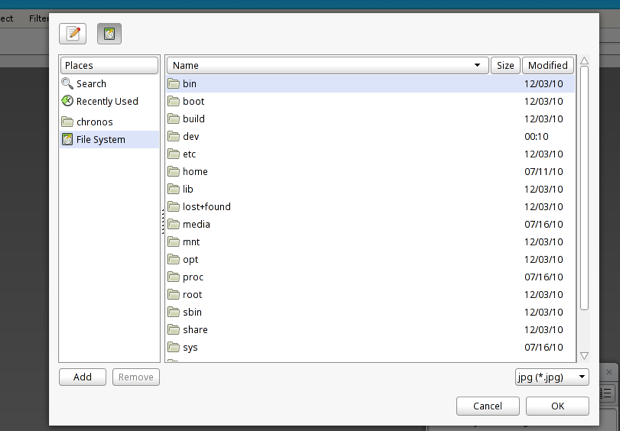 There aren’t any friendly folders like ‘My Photos’ or ‘Desktop’ – instead, you’ll find myriad directories with names that will probably only make sense to Linux users. I’m hoping that Google streamlines this significantly before Chrome OS hits production, because any ‘normal’ person who hits this screen is going to be helpless. More important has been the lack of 1Password support. 1Password is a great password manager (there are others, of course) and while it has a Chrome extension, it doesn’t seem to work with Chrome OS. Unfortunately this means I wind up having to pull out my phone to look up passwords as I need them, which is a pain. I doubt Google was happy about delaying the consumer launch of Chrome until next year, but this window of testing and feedback will likely prove quite valuable. And it isn’t the improvements that Google will be making over the next few months that will matter so much as the creation of third party software optimized for the platform. The more I think about it, the more I believe Chrome’s lack of driver support, its UI glitches, and Google’s stated desire to “test the software” are all sort of red herrings. Equally important, or perhaps more-so, is the fact that Chrome OS is going to rely heavily on third parties to fill in its functionality gaps. And at this point, third-party support has a long way to go. Plenty of applications would work very well as Chrome OS Panels, but their developers still need to build them. Web apps (and not just Google Docs) badly need to support offline storage. And some apps like 1Password don’t have Chrome OS support at all. Now, for the next six months or so, Google will have thousands of users toting around Cr-48, and you can be sure this crowd – which consists largely of early adopters and developers – will be very vocal when they encounter a pain point. And by the time these things (or their more polished brethren) start shipping, I suspect that most of these gaps will be filled. In case it wasn’t clear, Chrome OS is going to be a big deal. It isn’t just for the early adopters, and, provided Google and third-party developers can fill the remaining feature gaps and add some polish, it isn’t going to be steamrolled by the rise of tablets either. No, this won’t appeal to the sort of person who can use an iPad as their primary computer, but it could eventually become a viable alternative to Microsoft Windows in the workplace, and may even start eating away at Mac OS X for home use. Stay tuned. We’ll have much more to say on this in the coming days. Note: You may also want to check out Danny Sullivan’s recap of his first day with Chrome OS — he had similar issues with a password manager as well.